NEW! Samsung Flat-panel TVs with 30 channels of HD programming. Easy-access Plug-and-Play feature makes it simple to connect electronics. 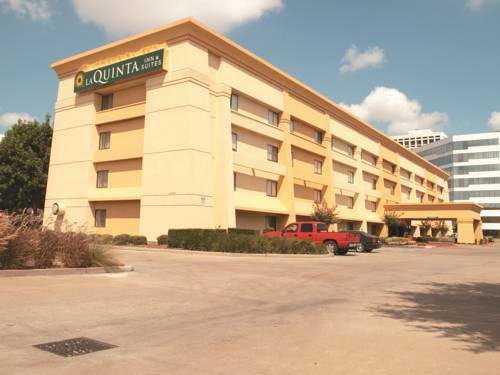 The La Quinta Inn & Suites Houston Southwest is in a perfect location just minutes from fun and adventure. We are seven miles from the Museum District. When attending sports and entertainment venues at NRG Stadium (formerly Reliant), Minute Maid Park, and the George R. Brown Convention Center, book your rooms here. Enjoy such nearby restaurants as Pappas Seafood and Ruth Chris Steakhouse, and shopping at The Galleria and Katy Mills Mall. All of the excitement of Space Center Houston is 32 miles away. All pet friendly, spacious rooms at the La Quinta Inn & Suites Houston Southwest include free high-speed Internet access and feature a spacious work area with an oversized desk and ergonomic chair among the many features in the various room styles. Grab an energizing workout in the fitness center and take a plunge at your leisure in our sparkling outdoor pool. The delicious Free Bright Side BreakfastTM is served each morning in the lobby. We have a meeting room for 20 people, and a guest laundry facility for extended stay (bus and truck parking available). We are seven miles from downtown Houston, just a few miles from Southwest Memorial Hospital, MD Anderson Cancer Center, Houston Baptist University, and Twelve Oaks Medical Center. If visiting Rice University and the University of Houston, this is the place to stay. From I-59: Exit at Hillcroft and take the service road South, then turn right on Savoy Drive.